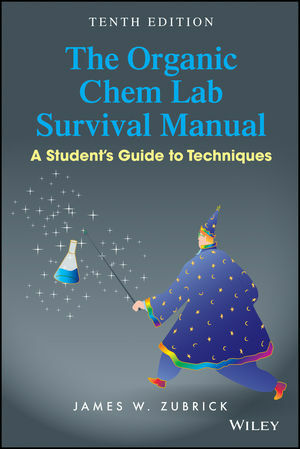 James W. Zubrick is the author of The Organic Chem Lab Survival Manual: A Student's Guide to Techniques, 10th Edition, published by Wiley. • Added description and operation of the SRS DigiMelt, a modern digital melting point determination apparatus. • Research notebook pages redrawn and additional instruction given on the perennially-difficult problem of what to write in a research notebook. Gold and silver standards of notebook keeping introduced. • Drawings of common apparatus updated. • The theory of extraction now appears with the practical presentation of the extraction and washing technique. • Recognizing the impact of the internet over handbooks on information acquisition, entirely new instruction on obtaining data on compounds from mobile devices, some of the pitfalls encountered, and some of the solutions for these problems are presented.